Energy regulators must cut charges imposed on Scots power firms for putting electricity into the national grid, Holyrood ministers have said. Scottish Energy Minister Jim Mather said current charges, linked to the size of power stations and distance from big population areas, were unfair. He called for a pay-as-you-go scheme where all power firms paid the same. Energy providers Scottish and Southern Energy and Scottish Power both backed the suggestion. Mr Mather said the current system discriminated against power companies in Scotland and favoured those in the south of England to the tune of millions of pounds. Green energy body Scottish Renewables also supported a change, saying the companies it represented were having to cope with massive hurdles. 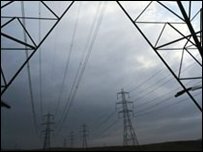 Making his plea to the National Grid and regulator Ofgem, Mr Mather said: "The present transmission charging regime actively works against the development of these resources, with a power station in central Scotland forced to pay £25m more for transmission than a similar facility in Yorkshire, and even more than in London." The Scottish Government plan would see the charging method changed to a standard £1 per megawatt, per hour for using the system. Scottish and Southern Energy chief operating officer Colin Hood urged Ofgem and National Grid to give "urgent consideration" to the proposal. John Campbell, of Scottish Power, added: "The current system of high and volatile transmission costs unfairly penalises northern generators and hinders the development of renewable energy resources."